A single ghost-like subatomic particle captured on Earth could finally help solve a cosmic mystery that has left scientists baffled for more than a century. The high energy neutrino – the first of its type ever detected – was traced four billion light years to its source, a distant elliptical galaxy with a giant black hole at its heart emitting jets of light and radiation aimed directly at Earth. Known as a 'blazar', this galaxy was the smoking gun that led astronomers to finally unravel the 100 year-old riddle around the origin of high energy cosmic rays. These rays, which consist of fast-moving elementary particles, pepper Earth from space and pose a threat to astronauts, as well as the crews and passengers of commercial flights. Discovering the ghost-like particle, which burst from the 'blazar' before the Earth formed, could provide an entirely new way of looking at the cosmos, scientists claim. The neutrino discovery, published in the journal Science, points towards one likely origin – powerful jets of accelerated particles fired from the poles of rapidly rotating supermassive black holes. 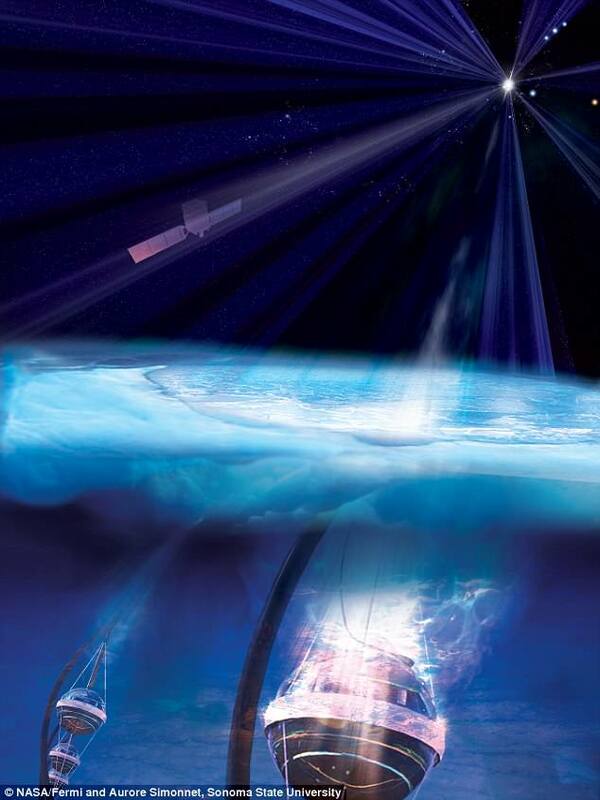 Until now, the origin of high energy cosmic rays was a mystery to scientists. Beyond cosmic rays, the latest finding could provide a new way of peering into the depths of the universe. Like the discovery of gravitational waves in 2016, neutrinos could be a new 'messenger', carrying energy across the cosmos. Neutrinos are the so-called 'third messenger', following light protons and gravitational waves. The discovery of a high-energy neutrino on September 22, 2017, sent astronomers on a chase to locate its source—a supermassive black hole in a distant galaxy. 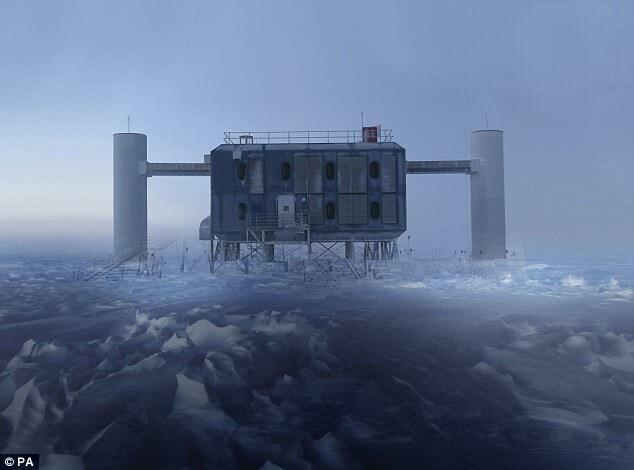 The high-energy neutrino was first detected on September 22, 2017 by the IceCube observatory, a huge facility sunk a mile beneath the South Pole. Here, a grid of more than 5,000 super-sensitive sensors picked up the characteristic blue 'Cherenkov' light emitted as the neutrino interacted with the ice. Having almost no mass and passing right through planets, stars and anything else in its way, the particle travelled in a straight line from its point of origin to Earth. As a result, astronomers were able to track its trajectory back across billions of light years to its probable source. News of the detection sent astronomers into a frenzy of activity as telescopes were quickly pointed in the suggested direction. 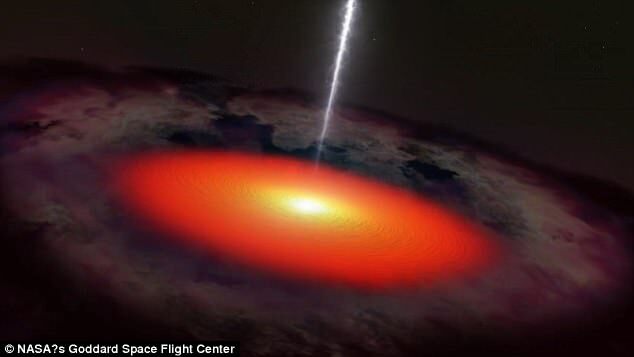 The search led to the discovery of a 'blazar', a special class of galaxy containing a supermassive black hole four billion light years away, left of the Orion constellation. A key feature of blazars is twin jets of light and elementary particles shooting from the poles of the swirling mass of material surrounding the black hole. NASA's Fermi (top left) has achieved a new first—identifying a monster black hole in a far-off galaxy as the source of a high-energy neutrino seen by the IceCube Neutrino Observatory (sensor strings, bottom). The neutrino detected by IceCube is thought to have been created by high-energy cosmic rays from the jets interacting with nearby material. 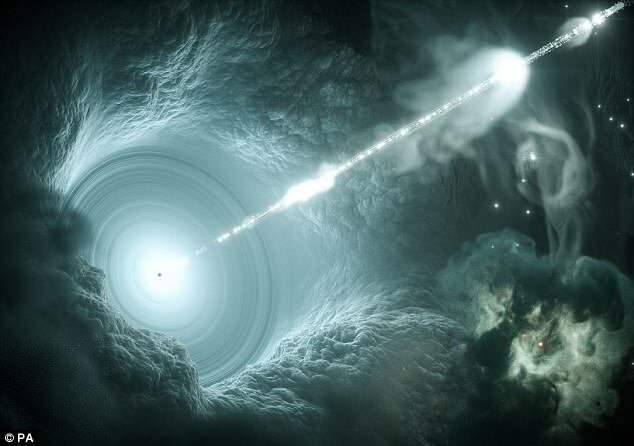 Professor Paul O'Brien, a member of the international team of astronomers from the University of Leicester, said: 'Neutrinos rarely interact with matter. 'To detect them at all from the cosmos is amazing, but to have a possible source identified is a triumph. Unlike high energy neutrinos, most cosmic rays carry an electric charge that causes their trajectories to be warped by magnetic fields, making it impossible to trace their origins. In contrast, neutrinos are unaffected by even the most powerful magnetic fields. 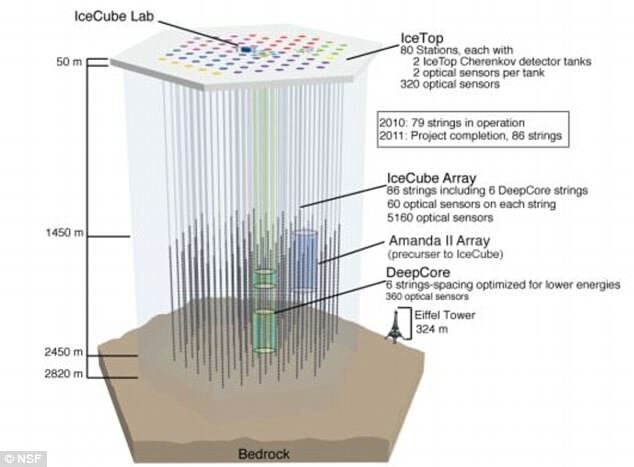 The blazar believed to have generated the neutrino, code-named TXS 0506 + 056, was located in less than a minute after the IceCube team relayed co-ordinates for follow-up observations to telescopes worldwide. Being able to detect high-energy neutrinos will provide yet another window on the universe, said the scientists. The sensational discovery of the second 'messenger', gravitational waves, or ripples in space-time, was announced in February 2016. France Cordova, director of the US National Science Foundation (NSF) that manages the IceCube laboratory, said: 'The era of multi-messenger astrophysics is here. Cosmic rays were discovered in 1912 by physicist Victor Hess using instruments on a balloon flight. Later research showed them to be made up of protons, electrons or atomic nuclei accelerated to speeds approaching that of light.